In wake of bus disaster, Chief Rabbi of Jerusalem calls to strengthen watching dignity of others. In the wake of today's bus disaster in which two sisters from Modi'in Illit were killed, the Rishon Le'Zion and Jerusalem Chief Rabbi Shlomo Amar called upon his students to strengthen guarding the dignity of others. "The hour is difficult for Ya'akov; this disaster certainly teaches us that the attribute of justice is hovering; may the L-rd have pity on us. Who knows, there may be too much slander and negative talk against each other; it always starts with words and ends with hatred. These election days contain a lot of tension; one criticizes the other and sometimes it comes to hatred, may G-d save us," he said during his lesson. He called for Jews to be careful not to embarrass each other. "I always said about the verse in Ecclesiastes: 'Remember your Creator in the days of your youth,' meaning in the days of youth, while you're young, remember the Creator. But what did he say? 'In the days of your youth (bachrutecha)' - 'bechirotecha' - 'during your elections'. During the elections, don't think that in the campaign it's permissible to humiliate and shame people, G-d forbid. In any case, this is something that should awaken us all to the glory of G-d, to the glory of the Torah, and to respect each other's dignity. "Cautiousness with dignity of the other person, I said, should be redoubled. The evil inclination tempts man during the elections, yet still one must preserve his honor and the honor of G-d. If someone speaks against the Torah one is to protest against them but not to hate them and not embarrass them, until the A-mighty brings them back," he said. 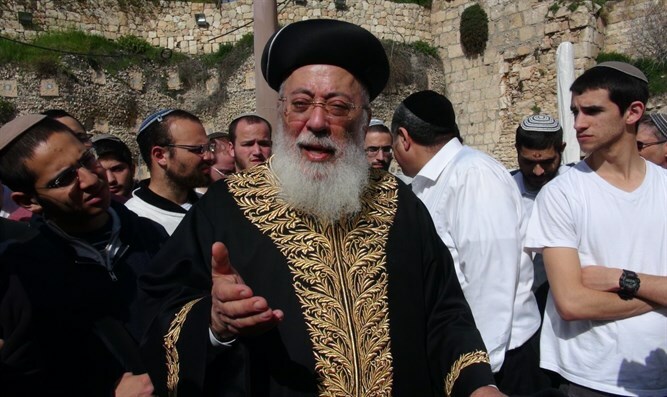 Shas spiritual leader Rabbi Shalom Cohen called to strengthen the sanctity of the Sabbath: "Master of the World, have mercy over Your people Israel; say we've suffered enough, remove the harsh measure of justice from us," he said when he learned about the tragedy. He mentioned the desecration of the Sabbath in Tiberias. "I heard that in the city of Tiberias they dispatched a bus on Shabbat to desecrate Shabbat in public. Shabbat is the source of blessing, and we must cry out that if we desecrate Shabbat, how will we have blessing? G-d is rousing us, we mustn't remain silent about the desecration of the Sabbath; everyone should take care to bring more and more Jews to observe the Sabbath, and by doing so G-d will protect us from all troubles."